This week Farm Fresh Supermarkets weekly ad circulars, store flyer and specials. Save with the Farm Fresh store ad featuring the best savings & promotions on fresh produce, meats, fish & seafood, dairy products and more. Check the latest weekly specials: Fresh White Corn; Farm Fresh Split Fryer Chicken Breast, Thighs or Drumsticks; South Carolina Fresh Peaches; Green Seedless Grapes; General Mills Cereal, Betty Crocker Fruit Snacks, Fiber One or Nature Valley Bars; Blue Bell Ice Cream; Smithfield All Natural Baby Back Ribs; Beef or Chicken Kabobs with Veggies; Oscar Mayer Classic Meat Wieners; Wild Caught Tuna Steaks; Fresh Sockeye Salmon Fillets; Land O’Lakes Provolone Cheese; Sweet Vidalia Onions; Kraft Jet-Puffed Marshmallows; Van Camp’s Baked Beans; Vlasic Spears or Stackers; Hellmann’s Mayonnaise; Dark Red Northwest Cherries; Ripe Haas Avocados or Mangoes; Golden Pineapple; Green Giant Large Portabella Mushroom Caps; Fresh Express Garden Plus Salad Blends; Jell-O Gelatin Snacks; Colgate Toothpaste; and much more. 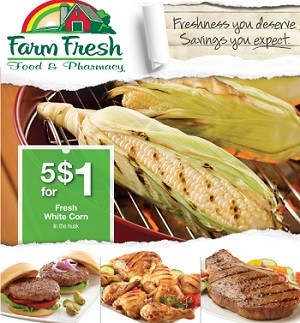 Farm Fresh stores activate their latest weekly ad every Wednesday. Farm Fresh Food was founded in 1957 as a neighborhood grocery store providing world class customer service. The retailer currently operates 44 stores in Hampton Roads, Franklin and Richmond, Virginia, and Elizabeth City, North Carolina, providing competitively-priced products, one-stop shopping services, and a large selection of quality national and regional brands.